We have been reviewing a number of Bestway summer water fun products and the last two that we have tested out are the H2OGO Bowling slip and slide and the H2OGO Football Stand water sprinkler. * Rampin’, Ridin’, Slidin’, FASTER fun! 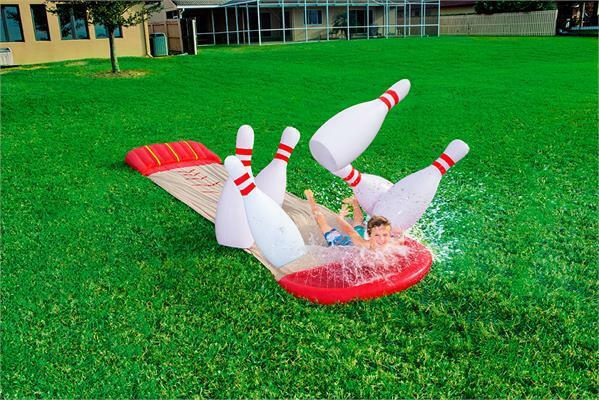 The H2OGO Bowling Slip and Slide adds to the traditional slip and slide experience. My Little One has a ton of fun on normal H2)GO slip and slides, so when you add in bowling pins to slide and know down, it adds more fun to the slip and slide experience. The bowling pins are a great, large size and the length of the slip and slide is awesome at 18 feet from start to end. As with other slip and slides, you hook the garden hose up and let it keep the slip and slide surface wet to make the surface slippery. The bowling slip and slide has the H2OGO trademark speed-ramp to ensure that the landing is cushioned. * Multi-function drain hole in the pool easily connects to garden hose. 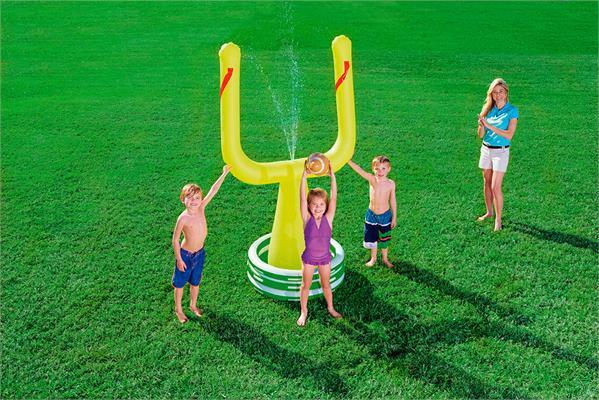 The H2OGO Football Stand has a sprinkler in the middle to keep everyone cool while throwing the football around. When inflated, the football stand is 83 inches. That is a pretty amazing size for this product. Everyone in the family will enjoy playing football with the H2OGO football stand. It is a great way to be active and stay cool on a hot summer day. Both products are made from very strong materials. I am always impressed with the durability and punishment that we can give in testing out the Bestway and H2OGO products. The products are easy to set up and take down. We hang them outside over a few of our chairs to let them fully dry before storing for the end of the season and these products are easy to hang to dry. Here is a great video from Bestway showing the lineup of Summer 2017 products….